Every IT leader would agree that delivering an excellent digital experience is a primary goal of digital transformation. After all, if investments in cloud and mobile do not improve the digital experience of customers and other end users, what good are they? As management guru Peter Drucker said, “You can’t manage what you can’t measure.” So it’s important to measure digital experience. We wondered how people were doing this. So, over the past week, we ran a digital experience measurement poll on Twitter. 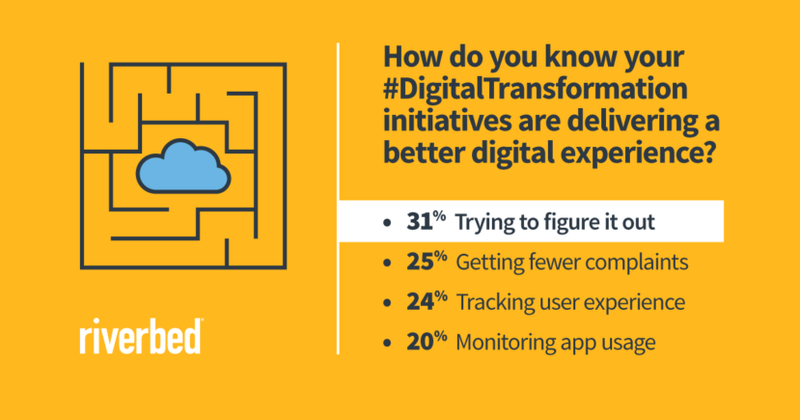 We asked how people know that their digital transformation initiatives are actually delivering better digital experience. Here’s the snapshot of our poll results. If you were hoping for a definitive answer, we’re sorry to disappoint. Sorry, but not necessarily surprised. Effective measurement is one of the key obstacles to successful Digital Experience Management. There are many different reasons for this. Enterprises have broad portfolios of business critical apps which must deliver excellent digital experience. IT must support the full range of enterprise applications – web, mobile, and apps running in the cloud, on virtual infrastructure, and legacy client-server environments. Enterprises have a variety of end users whose digital experience matters. Not just customers and the workforce. But also partners and suppliers. Measuring the impact of digital transformation on each of these populations requires different approaches. Many teams play a role in ensuring excellent digital experience, and each requires a different set of metrics and analytics. So a digital experience measurement approach that works for one team doesn’t necessarily work for all. Let’s take a look at each of the poll responses and analyze them for effective digital experience measurement. Maybe your end users have given up complaining and are suffering in silence. Worse yet, maybe they’ve given up complaining to you, and have moved to a competitor. What you don’t know CAN hurt you. If your service desk relies on end users complaints to learn of problems with poor digital experience, you’re at high risk for failure. Measuring the number of trouble tickets or user complaints received is useful. But it’s a poor substitute for measuring what end users actually see as they interact with your website or business critical apps. Watch this video to see how to proactively identify and resolve end user issues remotely and non-invasively. Monitoring the usage of business critical apps is a solid step up from measuring the number of user complaints. After all, tracking the number of downloads of your latest mobile app, or the traffic on your website is a good indicator of the volume of users. But when it comes to digital experience management, this approach still falls short. Tracking usage without tracking performance is like measuring quantity without measuring quality. Application performance monitoring tools can help you ensure your users receive an excellent digital experience for their app transactions. And combining End User Experience Monitoring and Application Performance Management, as SteelCentral does with AppInternals and Aternity, can enable you to achieve this goal. The 24% of respondents who made this selection are on the right track for effective digital experience measurement. Measuring the user’s experience, what they actually see, as business critical applications render on their device screen, is the truest measure of digital experience. It’s critical to measure the digital experience of every type of user – customer, employee, partner, and supplier. And IT must measure the digital experience for every type of business critical application in the portfolio. Not just web and mobile. There are a several methods of End User Experience Monitoring, so be sure to use the approach that meets all of your requirements. Unlike other products, SteelCentral Aternity measures IT from the point of consumption, the user’s device. This enables IT to understand the experience of end users for every type of business critical application in the portfolio. At 31%, this was the largest group of respondents. Thank you for your honesty! If you’re in this group, don’t despair! Measuring digital experience is complicated, and the results show that you’re not alone! As a first step to seeing a better way, try Aternity End User Experience Monitoring for yourself. Register here for instant access to Aternity in our cloud environment and take a self-guided tour of the key digital experience management use cases. If your digital transformation efforts include mobile, be sure to attend our recent webinar on Mobile APM on how to ensure a 5 star digital experience for your mobile apps, even in a BYOD environment.